In the spirit of Summer, The Skinny Cow, who recently launched their newest too-good-to-be-true treat, Skinny Dippers has teamed up with 5 Minutes for Mom for an amazing photo contest. The top prize is $500. During our weeklong vacation to Lake Tahoe, the kids loved swimming each day, and My Boy and Hubby had the greatest time trying out different dives, cannonballs, and launches in the pool. What a wonderfully captured summer moment! You are so going to win, you are the best photographer! That's a great photo! 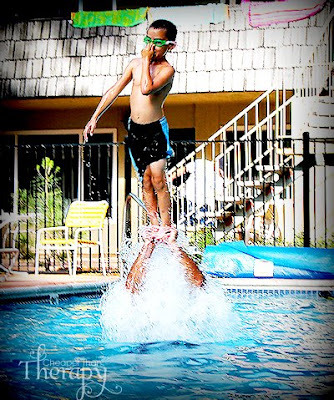 How much do kids love coming up with crazy jumps and dives? One of the best things about summer! Looks like fun was to be had by all!! Also looks like a winning photo!! Amazing picture! You are such a great photographer! I didn't realize that was A's hands. I thought W. had fins on his feet. Cool pix. HI! I'm back from my trip. sorry to have missed so many posts. Love this shot. great choice to enter in the contest! Amazing pic! It's bursting with fun and color! Also wanted to let you know that I've tapped you for an award. Thanks for being a part of what gets me smiling and going first thing in the morning! You are already a winner in my book. When are you going to start giving me those "virtual" lessons? Awesome photo for the contest! Wow! Very cool pic! He jumped in with those fins on?! I thought he had fins on his feet too! Wow, how hard was that? I love skinny cows too! Did you know they sell a huge box for uber cheap at Sams? That's a great picture! He's destined to swim with Shamu at Sea World!!! W O W this is a great photo and photo effect!! What an awesome action shot! What an amazing photo! I love it! It yells summertime! What a totally awesome photo!! FANTASTIC photo. It really captures that moment perfectly.